Have you ever been suckered into buying an item because it had a big “Mail-In Rebate” sign next to it? I will admit that I have purchased several items in the past with the intention of mailing in the rebate. What happens is I usually forget about the rebate entirely, which is probably what the manufacturer wanted me to do in the first place. I’m sure I’m not alone in my failed attempts of mail-in rebates. You can simply answer this question by figuring out how much your time is worth. If you’re satisfied with making $20-30 an hour, then a $10+ mail-in rebate would be worth your time, since most rebates should take less than 30 minutes of your time. Another way to figure out if a mail-in rebate is worth your time is to know what will be required for you to send in. If you have to send in a laundry list of items, the rebate may not be worth it to you, since there’s a bigger chance you’ll either forget something or just not send in the rebate. I actually love doing the rebates offered during back-to-school time at Staples. Staples makes it so easy because all you do is enter the rebate information on the computer and link your Paypal account for payment. Finally, are you buying an item just because it has a rebate attached to it, or because it’s a product you actually need and will use? It’s pointless to go through the hassle of a rebate for an item that will sit unused, even if you get it for free. Even though I have forgotten many rebates in my time, I have also received quite a few good ones. For example, I once received a $47 check for purchasing a bag of dog food. That’s right, I got a huge bag of dog food for free. My husband also sends in many mail-in rebates for computer parts that he has to buy. Get an extra copy of the receipt. Just ask the cashier if you can have an extra copy of the receipt when you purchase your rebate item. It shouldn’t be an issue. Check item/brand carefully. Make sure you’re getting exactly the right size, item, and brand for the rebate. Don’t throw anything away. Some rebates require the barcode or part of the packaging of the item, so be sure to keep everything in one place. Do the rebate the same day you make the purchase. The best way to remember to do the rebate is to get it ready as soon as you get home. I keep envelopes and stamps stocked at my desk to help me be more efficient at getting mail out. Don’t procrastinate on rebates or you might forget. Check on your rebate. Jot down when you submitted your rebate and the number or website to use to check on your rebate status. 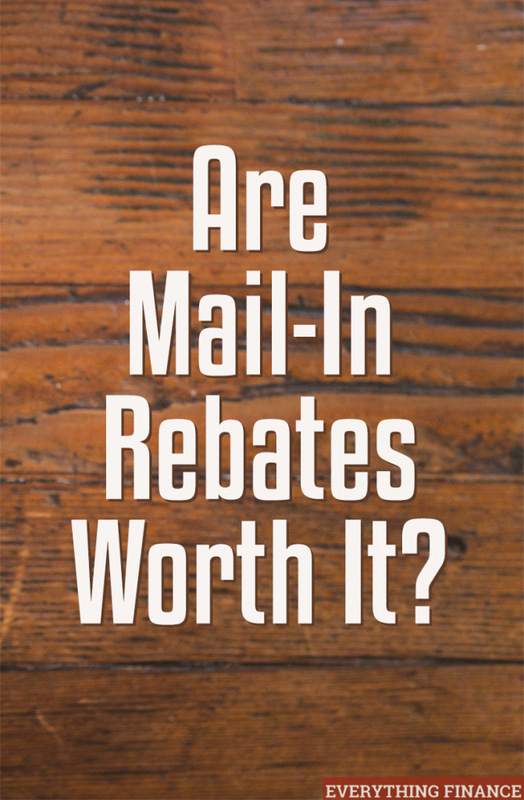 Are mail-in rebates worth it? I definitely think they can be if you purchase items you were going to need or use anyways, and if you actually do the rebate. Do you make the most of mail-in rebates? Or do you not bother with them?